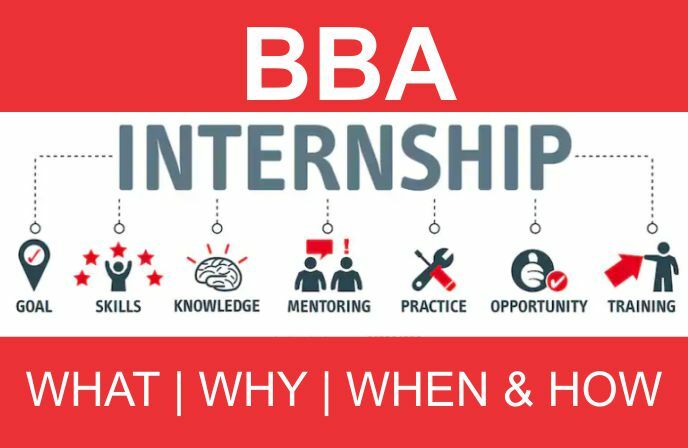 Students pursuing BBA Program are supposed to undergo a compulsory summer internship training in an organization for about six to eight weeks after they are done with second year of the course. Internships being a new phenomenon for almost all of these management students does create an anxiety in them as to how it shall be helpful for them, how to go about the complete process, and the likewise. This article is an attempt to clear doubts of BBA students regarding the Internships and how better they can use it as a tool for their own benefit in the long run. First up we need to understand that Internship is an opportunity offered by an employer to the potential employees, known as “interns”, to work in an organization for a short period of time. We may also call it as a job before the actual one or a peek into one’s own career before it actually starts in a true sense. One is expected to work in an organization, have real responsibilities, learn some new skills and utilize the existing ones and at the same time, you would be getting paid as well in most of the cases. Even if Internships may not have been mandatory, as they are, it is a proven fact that they are beneficial for the students in more than one way. 1. Application of knowledge in real life scenario – Internships provides you an opportunity to utilize your current domain knowledge and be in a position to expand the same by applying it in situations that are too dynamic where we may not be in a condition to apply a particular formula as we study in classrooms. 2. Work experience matters – Quite a few surveys suggest that about half of the employers value relevant work experience more than qualifications in the recruitment process. Getting work experience also adds to your knowledge and confidence levels that shall help you to get a good permanent job some time down the line. 3. Students may not know what they want – Internships may be used as a tool to identify, or even discover as to what you are good at. Suppose if you are hired as a marketing intern, but in due course of time you may get exposed to some other skills like content writing, something that you may like and hence, may eventually make a good career out of it. 4. Creates better opportunities – If you have done well in your internships, you may be offered Pre Placement Offer by the very same company. This shall act as a recommendation letter for you to get good placements in even better companies, in case you may want to work in a better company as compared to the original one that offered you Pre Placement Offer (PPO). 5. Even Stipend – Given a choice for working at the office instead of studying for a theory paper, it may be nice to work in an office instead and at the same time, you probably would get paid for the same as well. It may not be a huge sum of money, but certainly good enough to act as a motivating factor. When to go for Internships? Most of the firms hire interns throughout year, but mostly students get into internships during summer breaks as they hardly any curriculum engagements during that period. How to find a good Internship? Most of the top BBA colleges like Asian School of Business, Noida do have their own Training and Placement Cell who are in constant touch with various employers and can help you in getting an internship with a good firm. At the same time, a letter of recommendation from your professor may also help you in this matter. In a case where you may be a part of an institute that may not have a fully functional Training and Placement Cell, you may use internet to look out for internship openings. Quite a few companies also post their internship requirements on website and in such a case you may get in touch with the relevant company and mail your updated resume to them. In a nut shell, an internship with a good company can pave your way to a dream job and hence it can potentially change your life.